This weekend I had my mom's delicious cheesy potatoes. Her version is made up of boiled potatoes, sour cream, butter, chihuauha cheese and baked in the oven. It is always awesome and I wanted to make something kind of similar but also using roasted poblanos. The intial idea was combine flavors of the ﻿potato dish with chile con leche, which are roasted poblanos sauteed with onion and garlic and topped with some cream. 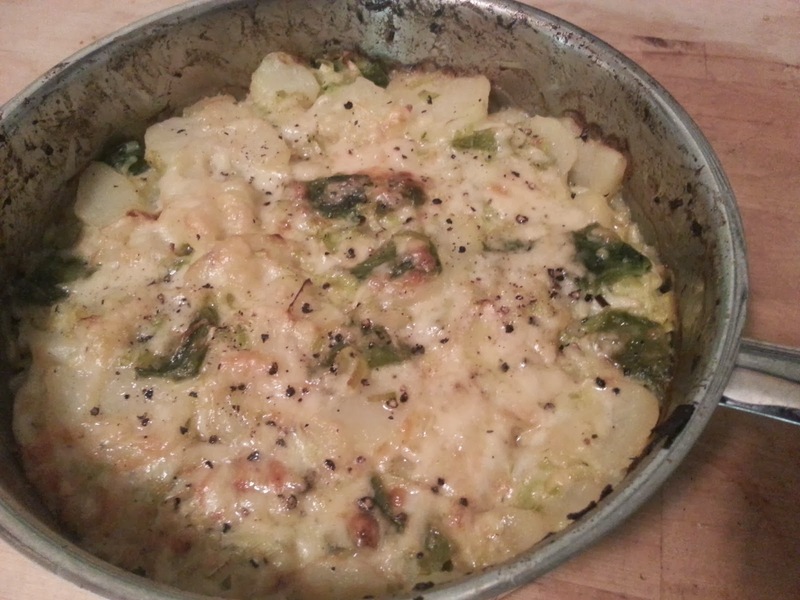 I went a bit further and added a bit of gratin ideas by utilizing thyme and gruyere cheese. 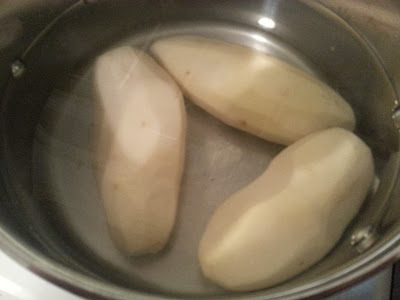 I started by peeling and boiling some large russet potatoes. While the potatoes boiled I began to roast the poblanos over the stove. I did this by placing over a stove burner at high heat. The goal is get as much of the skin blistered and roasted so that it can be peeled off. 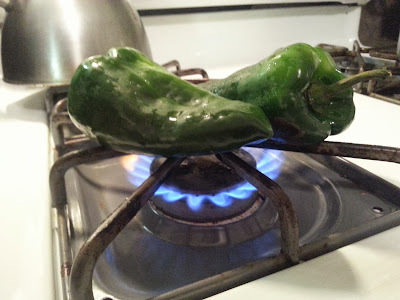 This is what the chile poblano looks like after roasting on one side. You might need to angle them to make sure to get the flame is touching the uncharred bits. In a pan I sauteed sliced leeks and garlic in butter. 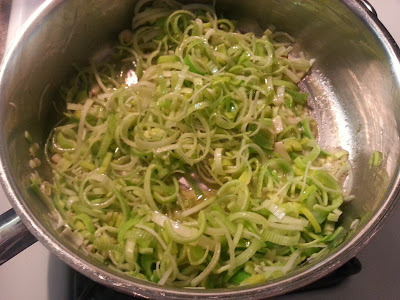 I thought of leeks when trying to think of more gratin comparisons. I think they compliment well with potatoes and gruyere. After the poblanos were roasted, I placed in a plastic bag for 10 min before peeling off the skin. Once cleaned I chopped the peppers and added to the pan. Once the potatoes were done I removed from the water and placed in an ice bath to stop the cooking process. 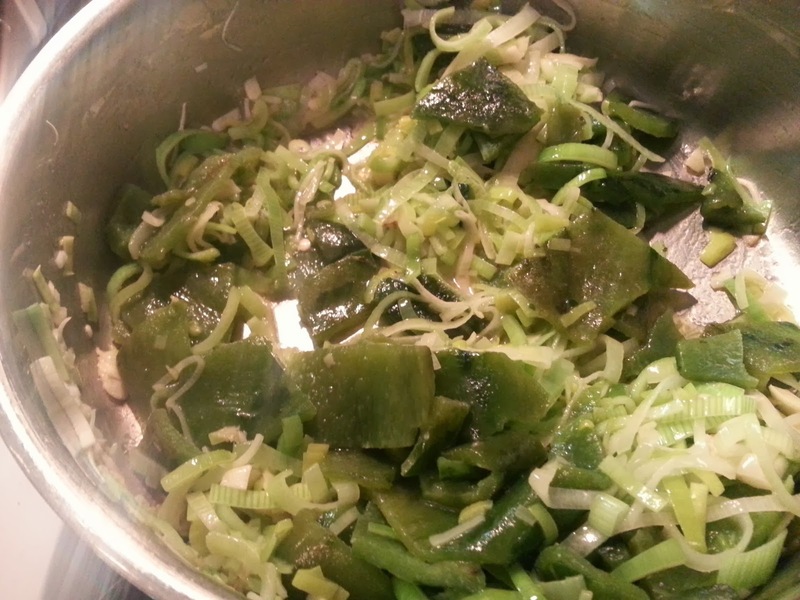 I then cut into slices and tossed with the poblanos and leeks. I finally added about a half a cup of heavy cream and some shredded gruyere cheese. 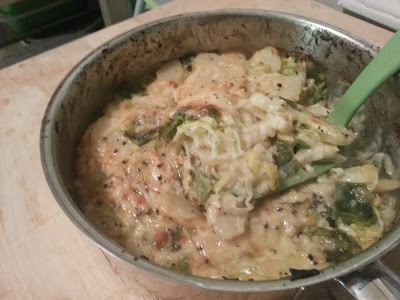 I flattened the combination into the pan as much as I could and topped with a bit more gruyere. ﻿The potatoes were delicious and the poblanos did remind me very much of chile con leche. 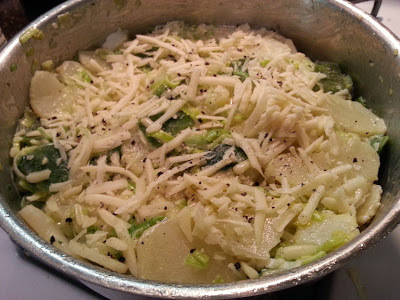 The gruyere also provided a nuttiness that went well with the chiles and potatoes. 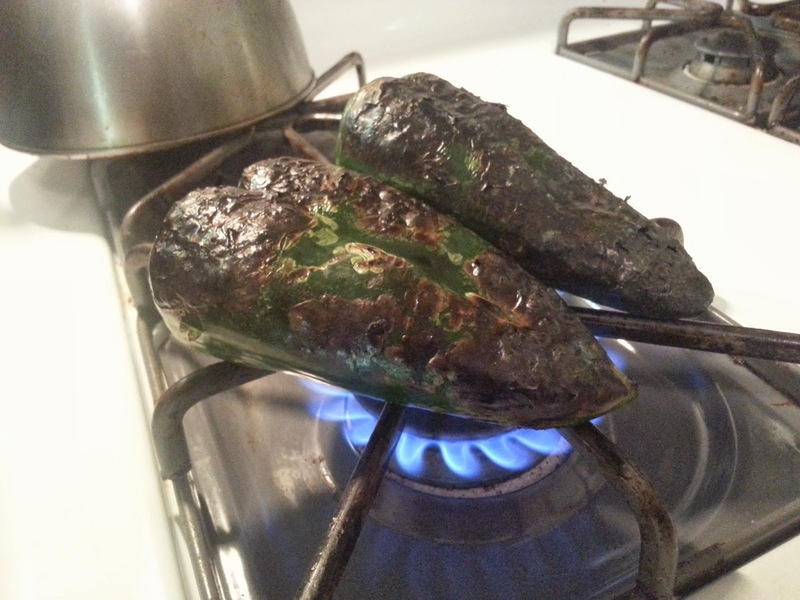 I would probably use more poblanos in the future just to get more spice and a contrast in flavors and texture. 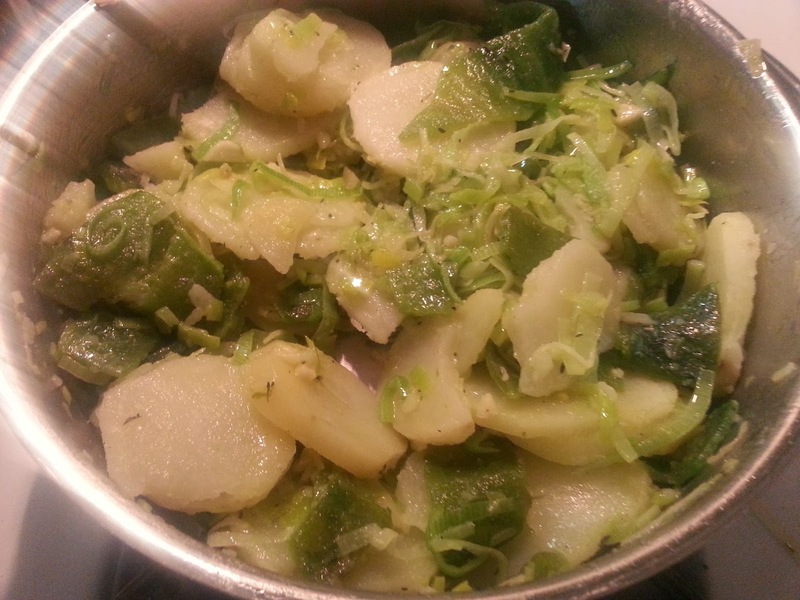 I can see this as a good fall side dish for the holidays maybe with the addition of some nutmeg to compliment the flavors of the gruyere and poblanos.